Nikola Tesla was born in Croatia in 1856 and came to New York City in 1884. His first job in America was working for Thomas Edison, but that didn't last very long. Tesla and Edison were total opposites of each other both in personality and in technology. Edison was convinced that DC current was the best way to electrify the world and Tesla of course new better. By early 1887 Tesla had opened his own company only blocks away from Edison. Within 3 to 4 months Tesla submitted the patents for the entire single and multiphase AC power generating system that we still use today. It was around 1888 when Tesla met George Westinghouse and together shared there ideas for the electrification of America. When news of the merger between Tesla and Westinghouse reached Edison he became outraged and began a smear campaign against the use of AC which included public electrocutions of dogs and cats which were stolen from his own neighbors and used as sacrificial lambs. A little known fact is that Thomas A. Edison is the man responsible for the invention of the electric chair. In a scheme spawned by the "battle of the currents", Edison and his associates in a attempt to deal the final blow to Tesla, Westinghouse, and the use of AC power, paid a visit to Sing Sing Prison. Shortly there after the the officials of the prison announced that executions would be carried out by electrocution. This is when the term "Westinghoused" was coined. On August 6, 1890 a man named William Kemmler, a convicted murder, was strapped into the chair and the switch was thrown. But Edison had miscalculated, the amount of power required to kill a human being was much larger than they expected. Kemmler did not die from the first jolt and the process had to be repeated several times during which the belts on the generator began to slip, some even derailed, and power was lost. As a result Kemmler was cooked rather than electrocuted. I have seen the actual movie footage of that first electrocution and it was a dreadful sight. George Westinghouse continued to set the record strait about the safety of AC in the household. There success finally culminated when they were awarded the contract to harness the power of Niagara Falls. The real controversy surrounding Tesla is not about power generation but about the discovery of radio. It was called, "the great radio controversy". In just about every account of recorded history the name of Marconi is given as the inventor of radio. This is simple not true. While Tesla was absorbed working on other projects a feeding frenzy took place on his radio patents. Many people, not just Marconi, copied his concepts and built on his work then tried to get patents of there own. Finally in 1943 the U.S. Supreme Court ruled in his favor and against the Marconi Wireless Telegraph Co., finding Tesla's patents had preceded all others. By then the history books had already been written and once a error of this kind is committed to print it is very difficult to correct. The publishers of the newer printings just continue to repeat the mistake. Tesla patented many inventions during his life but many were not. This is a man with such a flood of ideas that many were lost during the time it took to perfect others. 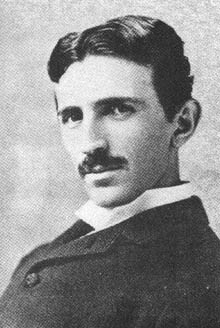 Besides the inventions of AC power generating and radio he also invented fluorescent lighting, the bladeless turbine, and the famous Tesla Coil just to name a few. I built my first Tesla Coil when I was around 15 years old, it produced a maximum of 500,000 volts. Since they were invented Tesla Coils have been used in all types of scientific research. Years later I used mine to take "Kirlian Photography", a process of exposing film by charging objects with high voltage. One strange effect that was produced by Tesla's largest coil was the production of a phenomena called "ball lighting". Before Tesla, ball lightning was only known to form by very rare natural events that are not yet understood. Ball lighting is believed to be very high energy plasma in a condensed form. It takes the shape of a spherical ball of energy that moves slowly usually parallel to the ground. It's creation and nature has baffled scientists for hundreds of years. Since his death people have duplicated his largest coils in hopes of creating ball lightning but have yet to succeed. Today's scientists have had limited success creating them with modern particle accelerators. It is believed by some that the understanding of ball lightning could aid in the creation of controlled nuclear fusion. Tesla is without a doubt the father of modern electricity and perhaps the greatest inventor that ever lived.